Communication, problem-solving, and time management are just a few of the talents that your employees need to overcome work-related challenges. 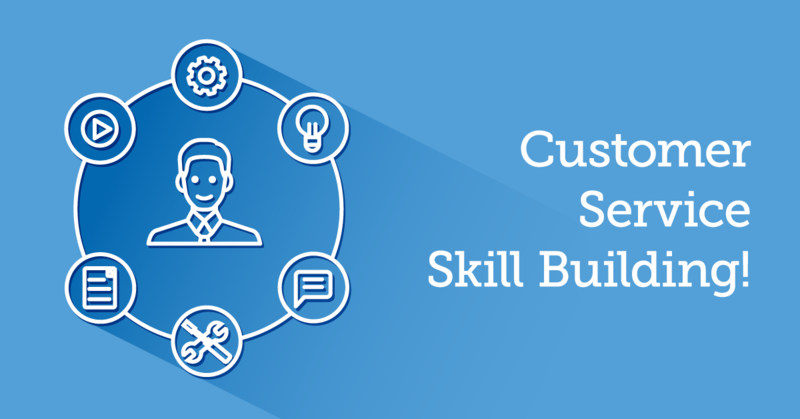 In this article, we’ll highlight 7 skill-building activities that are just right for customer service online training. Your customer service reps are on the front line of business operations. But are you equipping them with the skills they need to put your best foot forward? Or is online onboarding training the extent of your support? The key is to provide interactive, real-world online training resources that impart practical experience. Here are 7 skill-building activities that you may want to add to your customer service online training. Your employees must deal with mini emergencies on a daily basis, from disgruntled customers to co-worker spats that have the potential to escalate. The key is to prepare employees for these daily dilemmas so that they know how to deal with them. Branching scenarios test their decision-making abilities and expose them to different situations. For example, they must use all their pre-existing knowledge and skills to handle a customer complaint and achieve the desired outcome. If not, they receive feedback on how to improve their approach. Active listening, body language, and reading facial expressions all fall into the category of communication skills. Employees must use this skill set to identify and address customer needs. In some cases, even before the customer knows what those needs are. Online training simulations give corporate learners the opportunity to interact with virtual characters to improve their communication abilities. For example, a virtual customer states that they are dissatisfied with their most recent purchase or that they are looking for a replacement item to achieve a specific goal. The employee must listen to their concerns, answer questions, and get to the root of the problem, then use their skills to convey information to the customer. Solving problems is part of the job description for customer service staff. Even customers who don’t have a complaint, need help to find the right product or service an item. Serious games allow employees to develop problem-solving skills by advancing through levels and overcoming obstacles. It all starts with a brief introduction of the online training characters and the main conflict or challenge. Employees complete various tasks or solve problems to make it to the next round. In the end, they receive personalized feedback to highlight their areas for improvement. You can even incorporate rewards along the way to add extra incentive. Sometimes it’s difficult to see things from someone else’s point of view, especially when you’re on the job and aren’t familiar with every customer’s backstory. However, you can help employees develop their patience and empathy. Begin with a brief summary of the customer’s problem and why they need the product or service in the first place. Then offer more insight into their personalities or emotional state. This offers employees a glimpse into the minds of their customers and their primary motivations. Thus, they are better able to provide service, with the new understanding of what the customer is going through. Customer service also involves detailed knowledge of the products or services you offer. As a result, employees are able to hone their sales, negotiation, and persuasion skills. They have to know the product inside and out in order to find the ideal solution for customers. Not to mention, promote add-on products or services to increase sales and customer satisfaction. Online training tutorials combine images, text, and audio narrations to highlight every aspect of the item, including its features, benefits, and specs. It’s also best to show the inner workings of the product so that employees can identify unique selling points. For instance, a new use for the patented technology of your latest gadget that seals the deal. There’s no telling what hurdles each new workday will bring for your employees. Thus, you need to prepare them for every eventuality so that they can use skills in different contexts. As an example, the case study involves a recalled product that the company had to replace with a similar item or refund the consumer. Employees can see how the organization handled this process and ensure that customers received the best possible service. Case studies provide a real-world example of customer service skills in action, as well as the benefits of applying these skills on the job. They also demonstrate how certain talents or abilities can be applied across the board, especially when creative reasoning and lateral thinking skills are in play. Case studies provide a real-world example of customer service skills in action. There are times when employees must deal with a significant amount of stress and remain cool under pressure. Are your customer service associates able to diffuse the situation, or will they buckle under the strain? A stress test gauges how employees react when they’re faced with unhappy customers, product mishaps, and other work-related challenges. It may be in the form of an online training simulation, branching scenario, or a what-would-you-do assessment. Make sure that the obstacles are as realistic as possible to accurately measure an employee’s response. For example, include real-world images, sounds, and online training characters. That said, you should avoid putting too much pressure on your employees since this can lead to cognitive overwhelm. In addition, they’ll associate the online training experience with negative emotions, which hinders memory retention. These 7 skill-building activities for customer service online training focus on practical skills and real-world application. Thus, employees will be able to apply what they’ve learned instead of simply memorizing policies and procedures. It’s not just customer service reps who will benefit. Sales staff, IT experts, and anyone else who interacts with the public can use these online training resources to build their skills.